I am in love with almond flour. I discovered almond flour during the holidays while trying to find a way to make some low-carb cookies and cakes for my father. Not all almond flour is created equal. There are some brands available in the grocery store that have a very gritty texture which I do not enjoy. A gluten-free friend of mine suggested I try the almond flour from Honeyville Farms and I am so glad she did. The texture is light and very fine, and it has a delicate, nutty flavor. Yes, it is a little pricey but it is SO worth it since it bakes nearly as well as regular flour! I got a 10 pound bag of the stuff and I have loved adding it to different recipes to see what would result. This is one such recipe. 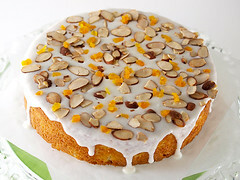 For a long time I have made almond cake with almond paste. 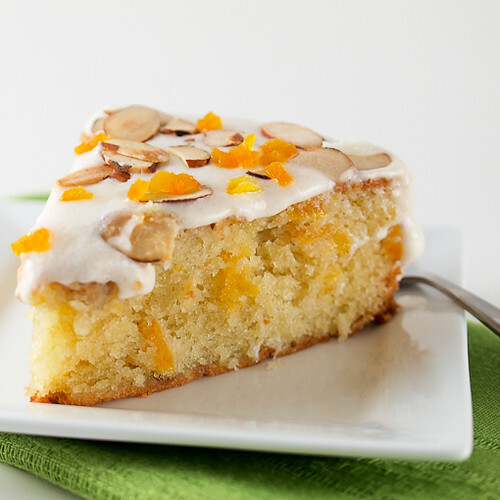 It is a good cake, but it can be a little dense and if you add any fruit it sinks right to the bottom. I decided to reformulate the recipe using almond flour. 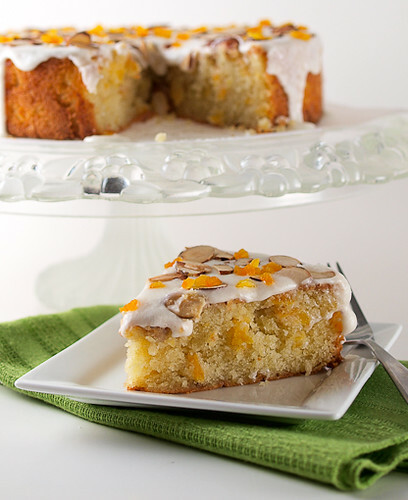 After a little tweaking I ended up with a nutty, sweet, very moist cake that is studded with tender, juicy bits of apricot. 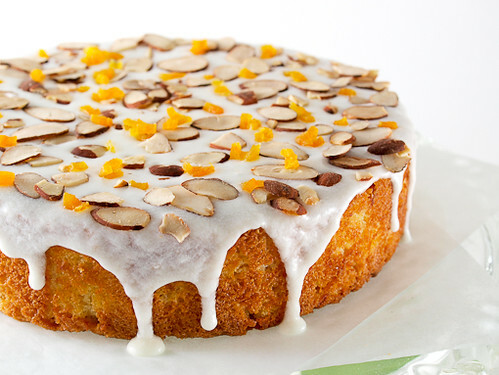 To finish it off I added a lemony glaze and decorated the top with toasted almonds and bits of dry apricot. It holds for up to three days, covered, on the counter, making it a good candidate for make ahead baking. Once decorated, the cake is homey, charming, and perfect for spring! Heat the oven to 350 F and spray an 8-inch cake pan with non-stick cooking spray. 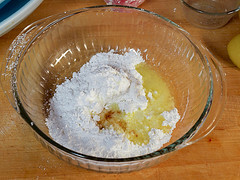 In a medium bowl cream together the butter and sugar until well combined and creamy. 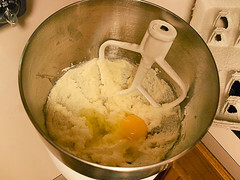 Add the eggs one at a time, beating for 30 seconds after each addition. Stir in the vanilla and almond extract. 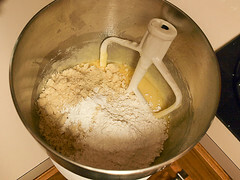 To the butter mixture all all at once the almond flour, all-purpose flour, baking powder, baking soda, and salt. Mix on low speed until the mixture is smooth. 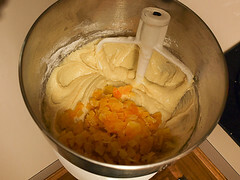 Fold in the chopped apricots. 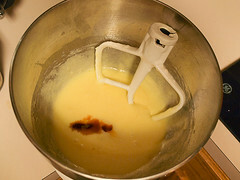 Spread the batter into the prepared pan and bake for 35 to 45 minutes, or until the cake springs back when gently pressed in the center and the edges pull away from the sides of the pan. After 30 minutes you may need to loosely cover the top of the cake with foil to prevent over-browning. Allow the cake to cool in the pan for 15 minutes, then turn the cake out into a wire rack to cool completely. While the cake cools prepare the glaze. 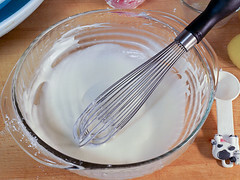 In a medium bowl whisk together the butter, powdered sugar, lemon juice, vanilla, and two tablespoons of the water. 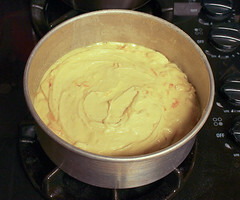 Add more water, a few drops at a time, until the mixture forms a thick pourable glaze. Once cool pour the glaze over the top of the cake and gently spread to the edges. 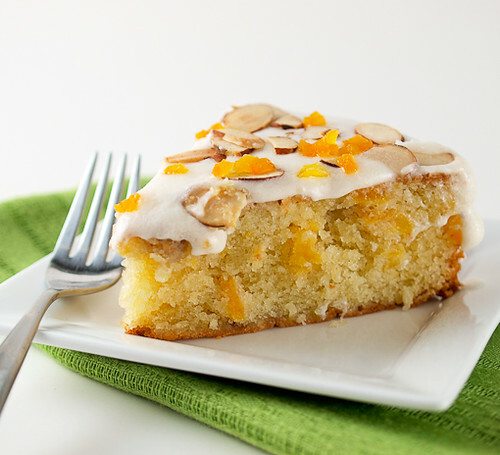 Decorate the top of the cake with the toasted almonds and dry apricot. © 2011, Evil Shenanigans. All rights reserved.